Chile’s Valley of the Dead (Valle de la Muerte) and Valley of the Moon (Valle de la Luna) offer a landscape so alien that it was used by NASA as a training ground for their Mars rover and lunar landing crews. This incredible desert terrain has been crafted and carved by wind and water over millennia, yet, it hasn’t seen a drop of water fall from the sky in over a hundred years. 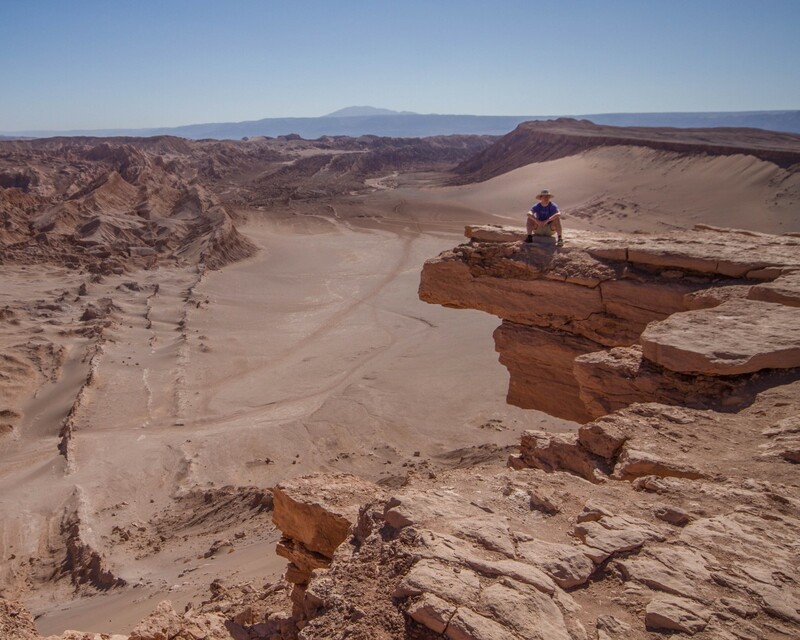 Located 13 km west of the very hip and active town of San Pedro de Atacama in the Atacama Desert, Valle de la Muerte/Valle de la Luna was our second stop in Chile after visiting bustling Santiago and beautiful Valparaiso. 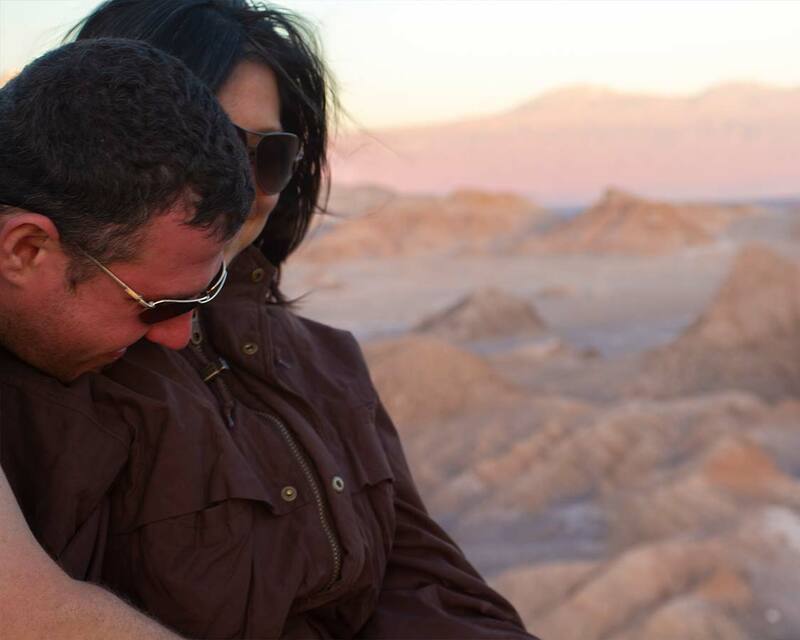 It became obvious early on that the Atacama Desert would offer my husband and I a challenging adventure. We arrived in the town of Calama after a one hour flight in order to avoid the 20+ hour bus ride from Santiago (not really an option as I was 6 months pregnant). We were able to book the ticket hassle free online from North America. From the Calama airport, we rented a small pick-up truck to get around the desert (also pre-booked from North America). The drive promised to be spectacular. About 30 mins into our 1-hour drive to San Pedro de Atacama, Kevin pulled off to the side of the road to give us our first glimpse of the terrain. The view was spellbinding with visibility going on for miles. After taking a few pictures, we both hopped back into the truck. A few moments later Kevin noticed that he no longer had his wedding ring. In a panic, he quickly pulled over; but in his haste, he went too far and got stuck. Not just a little stuck either, like wheels halfway into the sand stuck. I don’t have any photos of our predicament as I was too busy helping him furiously dig the truck out of the sand while he kept asking me to sit in the truck with the helpless fear that his very pregnant wife would die of heat exhaustion or give birth right there and then! My deepest gratitude goes to the incredible locals and tourists alike who stopped to help us along their way. Six different sets of people took time out of their day to help us. In the end, after three broken tow ropes, one broken shovel and a growing crowd cheering us on, Kevin was finally able to pull the truck back on the road! Oh, and his wedding ring had apparently fallen off in the truck not outside of it! Needless to say, he made sure to be much more careful about the consistency of the ground beneath our truck from here on out. Pro-Tip: If you are pregnant consult with your doctor before planning your vacation. 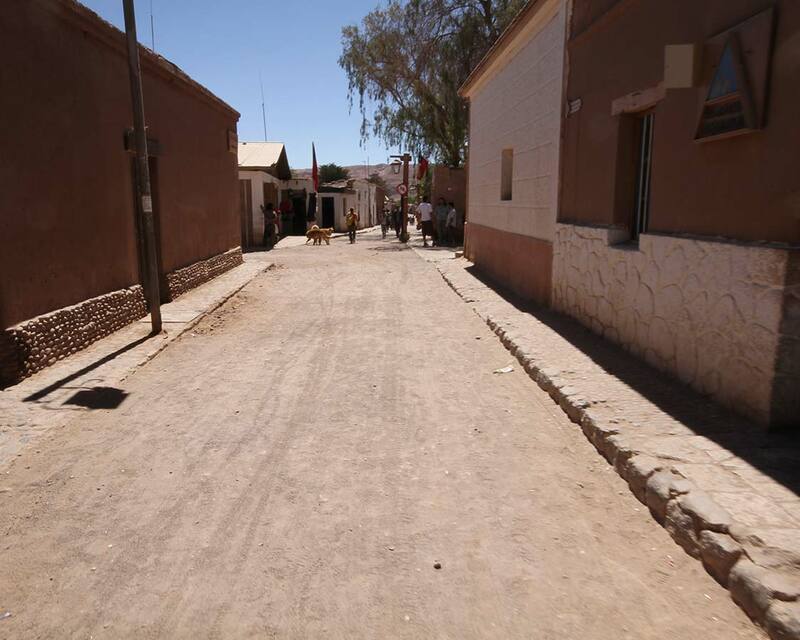 We rolled into the tiny town of San Pedro de Atacama a few hours later than planned due to our earlier mishap and were struck by how cool this little adventure town was. 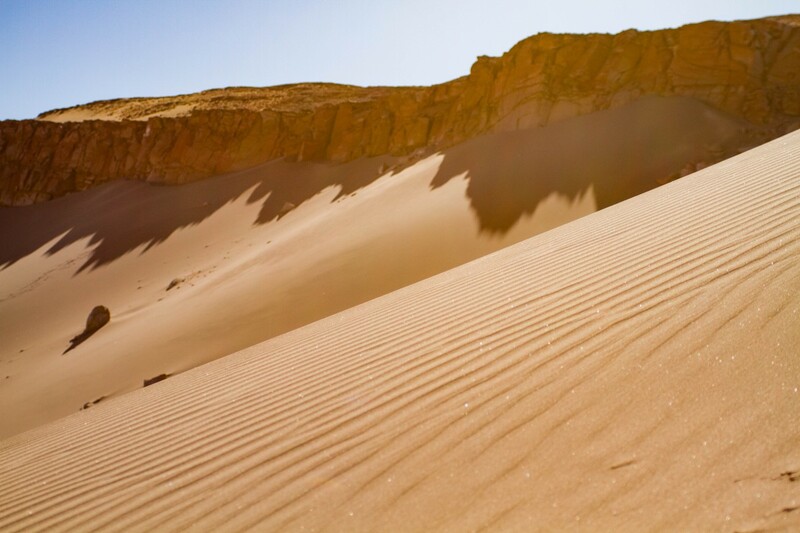 Sitting just over 100 km from Calama, San Pedro de Atacama is one of the only accessible towns available as a home base for those looking to explore the Atacama. 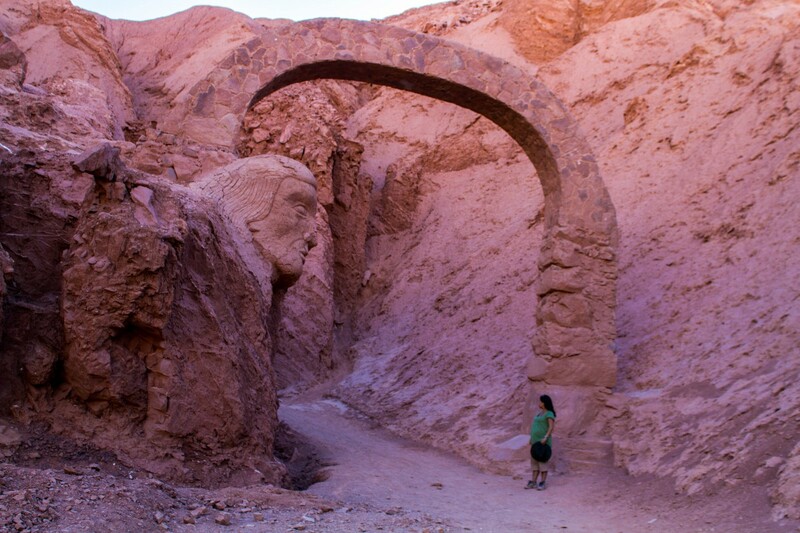 San Pedro de Atacama sits at about 7,900 feet (2,400 m) above sea level. It’s not rare for visitors to experience mild altitude sickness when visiting. Summer temperatures rarely go above 30°C and at night can often drop below freezing. The town has a number of quaint food joints to check out, our favourite being Adobe, which offered excellent pan steaks and a cool vibe with natural wood tables and chairs carved right from the stone floor along with a log fire that roars through the night. San Pedro has a long indigenous history and while exploring nearby, Kevin and I came across this incredible arch and carving tucked away behind a mountain. I’m not sure what this area is as it had a nearby sign mentioning it was indigenous property and respectfully asked visitors not to enter. If you know the story of this place drop us a message below, we would love to hear it! The following day we joined a tour group that ventured to the Valle de la Muerte for a hike and to visit some incredible archaeological sites. Our hike began with a stunning overlook of the canyon where a rock seemingly placed for the sole purpose of taking awesome adventure shots was jutting out over the edge. After stopping to check out the view, we continued along the ridge where the rock cliffs dropped away to soft sand dunes on our left before the two merged and we could slide our way down the sand to the canyon floor. Well, everybody else slid, I waddled…gracefully. While we wouldn’t be reaching the heights of one of our dreams of climbing Aconcagua, being that I was carrying my pregnancy belly, it might just feel like it. With most of the hikes in Atacama being at around 2,450 m above sea level, it wasn’t long before we were all breathing heavily and sweating under the strong desert sun. Much of the hike was on slightly rough but flat ground with some small cliffs and ledges to add just enough challenge and exhilaration to the beautiful scenery. Near the tip of the trail lie some beautiful twisting caves and overhangs that offered some shelter from the powerful sun. Pro-Tip: When going for hikes in the desert make sure to always have water. Additionally, since we were going to be around areas of high altitude I made sure to familiarize myself with the signs of altitude sickness. Since I was pregnant, I also made sure that the tour company carried an oxygen tank with them in case I needed it. 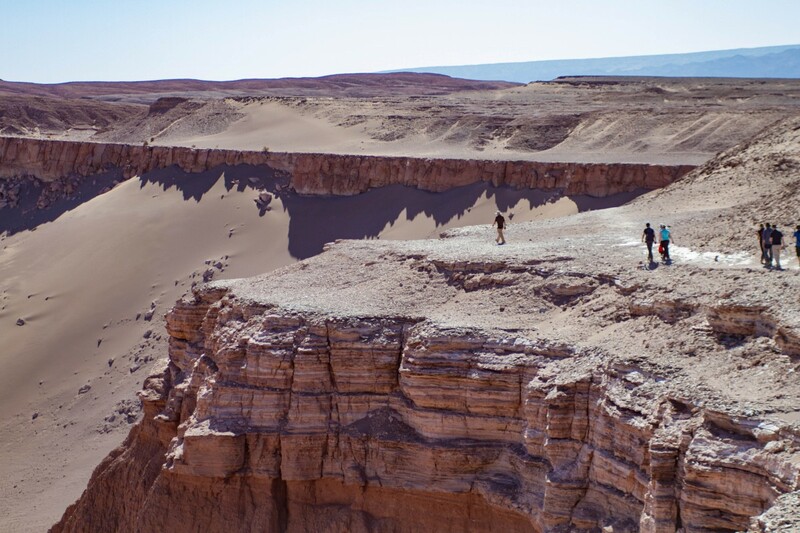 This is common procedure for a lot of the tour groups in the Atacama. Even though the hike was only moderately difficult, I struggled to keep pace with the group. The serene beauty of my surroundings and Kevin by my side gave me strength. Always keeping in mind that I had not only myself to think about these days, I simply took my time. I was constantly apologizing to the group whenever we caught up with them, but everybody including the tour guide was so supportive. In fact, they told me they were very incredulous at the spring in my step and took turns lending a hand through the most difficult portions of the hike. I had my own cheering squad. I even impressed Kevin! He said that if he had never trusted my incredible strength and resilience before, watching me hike through Quebrada del Diablo (Devil’s Canyon) and climb up the remnants of dried up waterfalls solidified it for him. Pro-Tip: When pregnant, always seek the advice of your doctor on the level of activity you should be partaking in, especially if it is going to be strenuous. Beyond hiking, Quebrada del Diablo is also well-known as an excellent mountain biking destination. 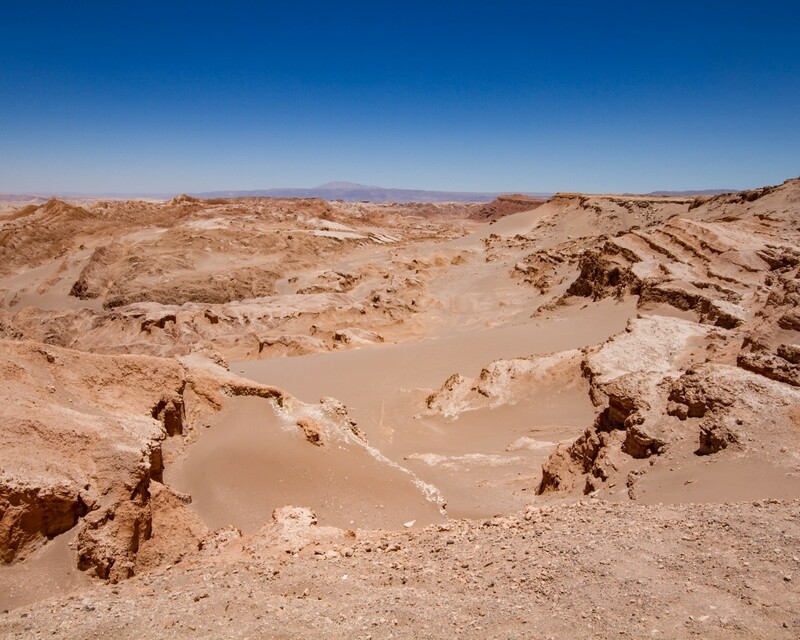 It can be easily accessed from San Pedro de Atacama and the twists and turns of the canyon would make for a thrilling ride, needless to say, at 6 months pregnant I was less than interested in the mountain bike option. With the day winding down we made our way to an overlook in the Valle de la Luna to catch the final rays of the sun as it made its way beneath the horizon. After pulling into a lot with several buses, we made our way up a winding hill to the highest point where could overlook the majestic landscape of the Atacama desert with the soaring Andes mountain range in the background. I sat down with my feet swollen and aching from the 10 km of hiking we had done that day and slipped off my hiking shoes to let my feet breathe in the cool dusk air and hopefully shrink down a few sizes before having to hike back down to the truck, but when I did, I noticed that my big toenail was dark purple and looked about ready to fall off (don’t worry, no pictures were taken)! Kevin and I sat and watched the sun go down over the Andes while the baby did some somersaults in my belly. I sat there, barefoot and pregnant in the Valley of the Dead and watched the landscape explode with colour while dreaming of the life our newest little traveler would have. I laid back in Kevin’s arms and there was no place I would rather be right there and then. Little did he know he would need to carry me back to the van. Wonderful pictures! And so brave of you to take on this adventure while pregnant! I’m heading to South America to do some trekking in November (although not pregnant) and I can’t wait! I don’t have much time so I’m going to shoot over to Buenos Aires then Patagonia, but maybe someday I’ll make it here! Thank you Trish! Would love to go back to experience the Patagonia region. Didn’t go on the original trip as the hiking would have been too much. It’s definitely on the bucket list. Have a nice trip! Thanks Erika! We also traveled to Oahu when I was pregnant with my first. Didn’t get a chance to go to Diamond Head but hubby told me the views were amazing. Hawaii is so beautiful! Great Article! Love the pictures and pretty descriptive! I love your photos! Glad that you were able to get out and that the locals were so friendly. Props to you for getting through this whole pregnant! Some great pictures here, and the sunset looks beautiful. Thanks for sharing! Great post. I studied abroad in Chile and took to the Atacama Desert for my “spring break” (: San Pedro was one of my favorite towns that I visited in Chile and such a shock for me too at how hip it was! Thanks for the happy reminder of such a beautiful time in the desert! cheers! Must have been an amazing experience studying in Chile! Thanks for stopping by! What a gorgeous place. You’re tough for hiking out in the desert while pregnant! Seriously, props! 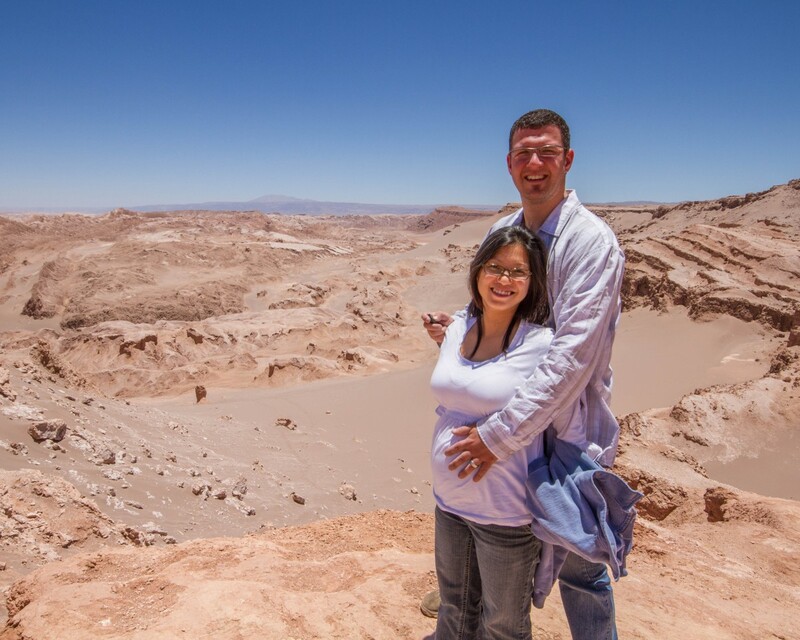 I gotta give you a tonne of credit for hiking while pregnant especially in Atacama. I was sooo not prepared for the hikes and it was scorching hot.. You have accomplished so much and I admire your success!! Thanks so much! I wasn’t as ready as I should have been. Forgot to pack a hat but thankfully it’s an easy item to buy in San Pedro. We are lucky too, the kids have turned out to be great travelers! Brave lady making an incredible desert journey while preggers! And what a fascinating/weird place to find. Wow, the whole place looks like a movie set! You were brave to take on the heat and the hiking. Personally I think I’d wait until winter to try that but with that looks like you had a nice little adventure! What a lady! What a great story and such beautiful images. Keep up the adventures. Solid post and quite the adventure, your baby’s gonna’ be a traveler without a doubt. That is amazing story! Thanks for sharing. The desert is magical indeed. Wow, what a unique area! You are a trooper boy! Pregnant and hiking are two words I don’t think necessarily have to go together 🙂 LOL It sounds like an amazing day. Thanks Angela. Chile was amazing! Yes, up until that hike I hadn’t really thought of hiking while pregnant. But the views were absolutely worth it. It was actually very calming. The most distressful part was when I realized my toenail was going to fall off. Can’t wait to go back and hike around the southern region someday. Did not realise there was a gorgeous desert in S. America too! Actually, had completely forgotten about it! What a gorgeous place! But your getting stuck adventure sure seemed scary! Not only is the content really strong, the title is just too good! That child of yours is a traveler in the making! Great post! I was there in 2010, but I’d love to go back and explore the area more. I love desert landscapes so much. There’s something so peaceful and serene about them. This is such a different type of desert. The canyons are quite intriguing. And those spiral stones have got me so curious. Well, that is impressive. 🙂 It really is a fabulous corner of the planet. These images brought back some very fond memories. Thanks! We really liked Death Valley in the US but had never really done any hikes. It’s an amazing place. You are an inspiration! Love the tips interspersed through the article too! How brave of you! But, indeed the place is amazing for a visit…so many unique land formations! What a terrific journey! The fact that you were pregnant really highlights your strength and fortitude. Good for you, you were rewarded with a beautiful adventure. 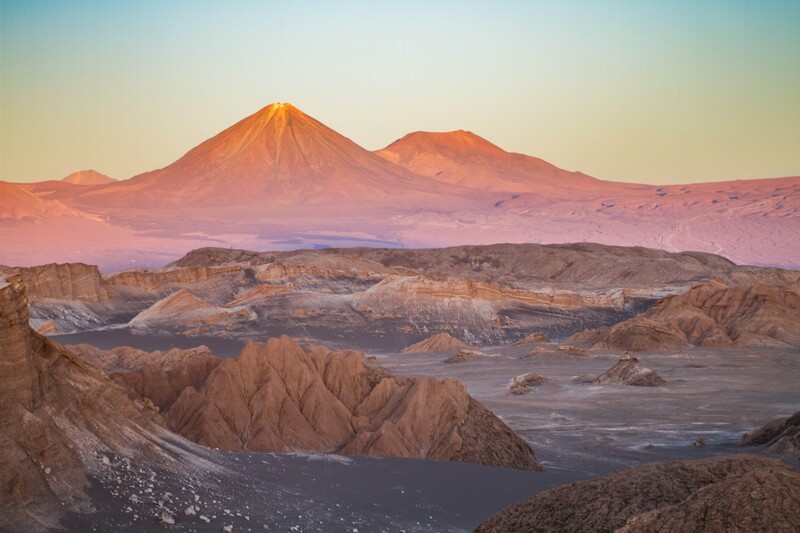 Love this post as I’m planning for my own possible trip to the Atacama desert. I’m amazed at the colors and history of the driest place on earth. The colors were amazing Brianna, especially during sunset. Hope you end up going to the Atacama. Wow! That’s an exciting trip. 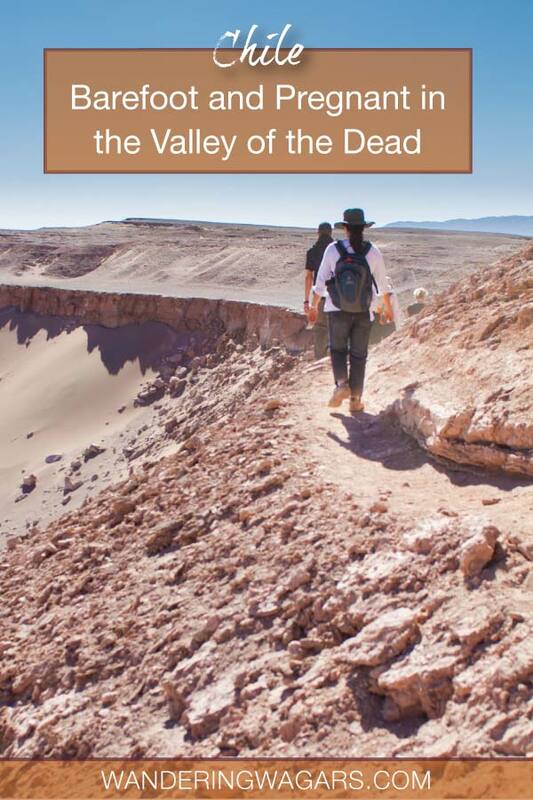 The hike to valley of the dead would be on my top list. Never been in this place and I am missing hiking too. I remember when I went to the death valley. IT was so beautifull, one of the best roadtrips I have done. From Yosemite to Las Vegas, through death valley. We really enjoyed Death Valley as well that couple of times we have been there. We hope to bring the kids there someday. What an amazing location! Love reading about a new location. Lovely photos. That was quite the adventure Christina. I love how strangers will usually come to the rescue, it restores your faith in people. That is such a strangely beautiful landscape. Wow, the terrain really does look otherworldly. No wonder NASA used it for training! WOW! This looks absolutely incredible. Would have been an awesome adventure! Wow, this earth is something else isnt it? Even more amazing it just how easily you make exploring seem even at 6 months pregnant. A great adventure you went on. I love your spirit and your photographs are quite stunning. What a fantastic trip! I adore hiking and this looks like an adventure that I would enjoy. And, pregnant or not, I would take the flight over a 20 hour bus ride any day! What a wonderful trip, though the beginning was a bit scary! Kudos to you for hiking! The colors are so striking, can’t believe we haven’t done any desert hike for such a long time. Wow, you’re quite the trooper. My sister in law is going to be due in May, and we are super excited about it all. We constantly tell her not to exert herself and to eat as much as possible. It’s incredible you made the trek, good for you. Oh, the last trimester is so tough! I was constantly exhausted. I definitely ate as much as possible too 🙂 Thanks for stopping by. We loved Chile so much! Can’t wait to go back. Glad you enjoyed the article. More to come! What an adventure and what a trip, stunning place, really out of this world. I can imagine your predicament when your vehicle got stuck. Hats of to your indomitable spirit. This is awesome! You will definitely have some cool memories to look back on after your child is born. What an adventure, even if you did get a ‘little’ stuck! But it was worth it for the experience and the stunning images, right? Looks like an amazing trip! Amazing pictures! Really felt i was there when reading your story, it sounds amazing. Very impressed that you managed to hike it being 6 months pregnant. That was so brave and determined for you to hike in that Valley of the Dead and Devil’s Canyon! I can’t even imagine myself hiking there and not pregnant 😉 Love the photos too! Beautiful pictures! I love this… It will put all the people that call in sick to their office jobs while pregnant to shame haha! I can’t even imagine doing this as a man let alone being pregnant. Awesome job! I like canyons, but I prefer those with some water or river floating at their bottom. Sand is sooo dry and hot. 🙂 But anyway, an amazing place once again! Wow, the formations and the colours! Beautiful pics and hike- but I think the most amazing thing is that you did this when you were pregnant. I can’t believe you hiked 10km with a big belly. Mad props to you for being an inspiration and your husband for being so supportive along the way! Great photos! And I’m so glad you guys were able to get the truck out. It was very nice of everyone to help you. I love that traveling can show you the kind nature of people. Wow! I get nervous when I read your great article. This is a difficult trip for those who are pregnant. But you can keep up with people, an effort worthy of recognition. Great post and photos. I remember I saw this on local tv two years ago. Wonderful place to visit. Hi, so, it is safe to travel there while pregnant? Is the high attitude not a problem? We had no problems with the altitude even with all of the hiking that we did. However, if you are considering traveling to any extreme place we recommend consulting with your doctor beforehand. It’s always good to see if you need to take any precautions.